Cuba Platform Fisheries: Collapse or Recovery? Analysts of pre-revolutionary Cuba’s economy wondered why the potential for the development of a vibrant national fishing industry had not received proper attention. This started to change in the 1950s as the country’s newly established development banks began to allocate resources to promote the fishing industry’s growth (Alvarez Díaz 1963:1032– 1038). Further impetus was provided by the revolutionary government’s decision in the 1960s to assign priority to the sector, a decision facilitated by the Soviet Union’s capacity to extend to Cuba the financial and technical resources for fishing industry development. This paper provides an overview of the evolution of Cuba’s fishing industry over the last 60-odd years, briefly describing fish landing trends and factors behind them. The overview provides background for the paper’s main focus: exploring the environmental underpinnings of changes in total fish catch since the early 1990s and what it implies for the future. While a priori it is reasonable to assume the sector’s negative performance responded to difficulties akin to those faced by the overall economy following the Soviet Union’s disappearance, the evidence suggests that damage to the platform marine environment2 was a major contributor to the uncertain future of fisheries. The Cuban archipelago is endowed with a marine environment that nurtures the development of numerous fish, crustacean and mollusk species. This includes a coastal habitat with 3,211 kilometers of mangrove forests and 26,563 square kilometers of seagrass meadows (Machlis et. al., 2012:227), together with 4,900 square kilometers of coral reefs, Cuba accounting for 2% of the world’s coral reefs (Burke et. al. 2011, Table 4.1:42). The condition of mangroves and coral reefs along Cuba’s coasts (inclusive of adjacent platform waters and keys surrounding the main island and Isla de la Juventud) is a vital indicator of environmental health and thus of the capacity to sustain an economically viable platform fishing industry. Coastal marine ecosystems are under threat across the globe. Estimates suggest that as many as half of all mangroves worldwide already have been lost to human activities (e.g., harvesting of mangrove forests for fuel and timber, development of tourism sites, shrimp farming), just as coral reefs have been decimated by land reclamation, overfishing and coral mining. Natural causes, such as extensive bleaching, also are responsible for coral reef losses as sea temperatures rise because of global warming (World Resources Institute 2000:74–85). Equally noxious to the marine environment is the pollution of coastal areas, particularly that produced by the contaminated runoff of agricultural fertilizers (e.g., nitrates and phosphates) to the seas. In high concentrations, these chemicals contribute to algae growth by depleting oxygen concentration in water, causing numerous coastal creatures to suffocate, aside from forcing fish species to migrate and interfering with their capacity to reproduce. Finally, natural water balances in coastal habitats are disrupted as sea levels rise and/or freshwater courses are dammed. Such developments could damage, sometimes irreparably, vulnerable coastal marine environments and their inhabitants. Certain fishing practices, finally, pose major threats to marine ecosystems. Excessive capture of target species disrupts finely tuned ecological balances upon which the robustness of the environment depends. Overfishing is a major concern in most regions of the world; nearly half of all fish stocks are estimated to be harvested at or past biological limits. Some fishing techniques, like bottom trawling, are extremely damaging as they destroy habitats. Trawling more generally, despite active measures (e.g., mesh size) taken to minimize the capture of non-target species, often leads to lasting damage in otherwise productive fisheries. 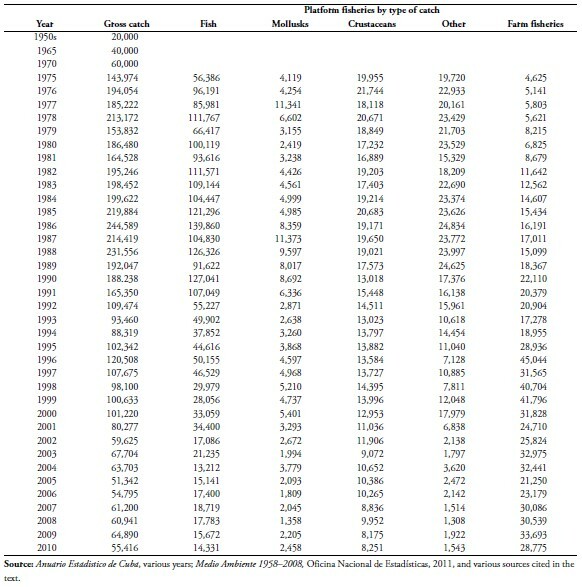 Between the mid-1960s and the mid-1980s, the Cuban fishing industry experienced explosive growth, as shown in Table 1. The pace of growth was quite notable at the beginning of the period, with annual fish landings doubling between the late 1950s and mid- 1960s as “motorboats replaced sailboats, fishing cooperatives were formed, better supplies became available, and more efficient fishing gear was developed” (Claro, Baisre et.al. 2001:194). Even greater momentum was observed during the 1970s as fish landings tripled within a few years. According to figures provided in a United Nations University study, in the 1970s and 1980s fishing in international waters accounted for about two-thirds (Figure 1) of the total Cuban fish catch (Baisre Hernández, Abraham and Kristófersson 2006:6). Following the implosion of the Soviet Union, the trend for both platform and international water fisheries was dramatically reversed, the catch declining nearly monotonically by 82% between 1991 and 2010, or by about 110,000 metric tons. Masking the magnitude of the overall sea fish landing collapse was a major increase in land aquaculture (last column on Table 1), an activity barely known in Cuba in the 1960s. Aquaculture increased, if at an uneven pace, by close to 600% between 1975 and 2010. Much of the fish farming growth is linked to the increased availability of fresh water reservoirs as Cuba’s rivers were dammed. Excluding fish farming, between 1986—the year when the highest fish catch was attained—and 2010, the fish catch declined by 86%, from 192,224 to 26,641 metric tons. The decline was significant across all types of catches, including those in international waters. After 1990, international landings only accounted for a small percentage of total fish landings, just as platform fisheries recorded substantial declines (Baisre Hernández and Kristófersson 2006:6). Particularly severe were the declines in platform “fish” and “other”3 landings between 1990 and 2010, 89% and 91% respectively. Mollusks and crustacean fisheries declines, while significant (72% and 37%, respectively), were not as substantial. The fishing catch trend closely parallels development in the fishing industry infrastructure as recounted in various sources. In tandem with the mid-1960s policy of expanding sugar’s role in the economy, the fishing sector received a major boost. Two goals were pursued: increasing total landings and developing the industry’s processing capacity (Baisre Hernández and Kristófersson 2006:15). Tapping credit lines made available by Spain and Japan, Cuba began acquiring a large and modern fleet to fish in platform waters, as well as in the Gulf of Campeche traditional fishing ground, for decades harvested by Havana-based long-range fishing boats. In a few short years, the Cuban fishing fleet was fishing globally. By the 1970s and 1980s, Cuba’s trawlers and support vessels were plying North and South Atlantic Ocean waters, even harvesting highly productive South American Pacific fisheries. These feats often were accomplished with Cuban fishing vessels acting as complements to Soviet fleets equipped with massive fish processing ships.4 Processing facilities, ranging from ports to distributions centers, were simultaneously developed all around Cuba. Their locations, together with Cuba’s main platform fishing regions, are shown in Figure 2. As was the case with sugar, the initial fishing sector expansion policy proved unrealistic, as over-optimistic projected production goals could not be met. This failure was anticipated by findings of technical assistance missions of the U.N. Food and Agriculture Organization (FAO) (FAO/UN 1966). As shown in Table 1 (and Figure 1), in the 1950s, Cuban commercial fish landings averaged 20,000 metric tons per year, a haul that was just about doubled by the mid- 1960s (Baisre Hernández, Abraham and Kristófersson 2006:5). Yet, absent studies of internal and external demand, or of the availability and economic sustainability of fishing stocks, planners in Havana set the arbitrary goal of landing 250,000 metric tons by 1970 (FAO/UN 1966, Part 3:2). Aside from failing to provide an empirical basis for the fishing target, the FAO report found the plan was equally remiss in considering the fishing infrastructure (e.g., vessels, ports, processing facilities) requirements for handling such a catch increase, let alone whether the skilled personnel necessary to man trawlers and other fishing vessels was available. Expansion of the fishing industry was predicated on the modernization of its infrastructure, as until then the fishing industry was mostly artisanal in nature. The fleet of the fishing cooperatives established in the early 1960s, which early on proved to be quite productive, consisted of some 3,300 small boats, mostly wooden, seldom more than 33 feet in length, about two-thirds of which were motorized. The more modern Cuban Fishing Fleet, gradually expanded since 1962 and equipped with steel-hulled ships, by 1965 included five 100 ton trawlers and eight 240– ton tuna vessels. However, the East German-built trawlers (SRT-Rs) were regarded as inefficient and obsolete. The Spanish (mostly) and Japanese tuna fishing boats, despite their more efficient design, were improperly maintained. A further 26 modern fishing vessels were expected in Cuban ports in 1966, 20 for capturing tuna and the rest for cod. So rapid was the expansion of the Cuban fishing and commercial fleets in the mid-1960s that—according to the FAO report—half of Spain’s shipyard capacity was committed to building fishing vessels and freighters purchased by Cuba. Handicapping the effectiveness of these investments was the scarcity of trained Cuban crews. Captains and first officers of the SRT-Rs, for example, were Soviet, whereas half of the crews of tuna boats were Japanese. Not coincidentally, the productivity of these vessels was 40% to 60% below rated capacity. Crash training programs for fishing industry professionals and crews gradually bore fruit. Within a few years, as depicted in Table 2, Cuba was deploying a much expanded fleet of modern and larger fishing vessels. By 1979, the Cuban fleet consisted of 313 vessels (of various types), divided into three fleets, two of which were dedicated to high seas fishing. Of these, 31 vessels were exclusively devoted to fishing for tuna. Uniquely, the shrimp fleet consisted mostly of refrigerated ships. Actual fishing for shrimp was the responsibility of the platform fleet. By 1980 the platform fleet had more than 1,000 vessels, generally larger than previously, many being built in Cuba under the direction of Soviet-trained Cuban naval engineers. Table 2. Number of Cuban Fishing Vessels by Fleet, 1970 to 1980,a and Number of Platform Fishing Boats by Length, 1979 and 1980. The collapse of the Soviet Union decimated the Cuban fishing fleet. Details are revealed in the previously cited 2006 assessment of the status and prospects of the Cuban fishing industry (Baisre Hernández, Abraham and Kristófersson 2006). While in the 1990s the land-based Cuban fishing industry infrastructure (such as docks, processing facilities, repair workshops) retained some of the modern, but deteriorated, features acquired with Soviet subsidies, it could no longer keep or operate the long range, modern fishing vessels cruising the far-away seas in prior decades. Since the 1990s, a common sight in Cuban ports has been the deteriorating remains of the onceproud Cuban fishing fleet. Today’s predominating fishing boats are smaller (none exceeding 24 meters, many being just 10 meters long), less fuel-consuming, and primarily short-range. In some respects, the current fishing fleet is reminiscent of the fleet of the 1960s, except that it is more up-to-date since it consists mostly of fiberglass hulled motorboats (largely unavailable in the 1950s and 1960s), although the fleet still includes wooden, cement and steel hulled vessels. According to a Fishing Ministry report cited by Baisre Hernández, Abraham and Kristófersson (2006:8), around 2005 the fleet consisted of 58 shrimp boats (23 meters of length on average) and some 1,300 other boats used to fish for lobster (245 boats), tuna/albacore (32 boats), and reef and small pelagic fish (465 boats). An additional 587 boats were assigned to small-scale coastal fisheries. While the reduction in the size of the fishing fleet is quite significant, the situation of the industry is in fact direr than suggested by the fishing vessel statistics: maintaining the remaining fleet is proving to be a challenge. At the shipyard in La Coloma—Cuba’s most important fishing port, located in southwestern Cuba (see Figure 2)—during the first half of 2012 it was only possible to return to service nine of 28 vessels scheduled for repairs (Súarez Rivas 2012). Delays were attributed to shortages of spare parts and inputs such as wood, cement and metal parts. Due to these shortages, one fishing boat had been in port for 19 months, other repair delays lasting from seven months to a year. Maintenance problems affect all vessels, irrespective of target species. Worse, the backlog interferes with regular maintenance timetables, which are contingent on seasonality factors. Economic costs are therefore significant. Of the six blue water vessels operating out of La Coloma, only one was able to put out to sea in February and March, 2012, none being seaworthy in April. There was concern about being able to harvest the highly profitable lobsters; overall landings could decline as 19 of the 70 lobster fishing boats operating out of La Coloma had maintenance issues. If La Coloma—a major fishing port that accounts for 40% of Cuban fisheries export revenues ($65 million in 2011)— confronted such worrisome prospects, one can only speculate about how the fleet is faring in other less high-profile ports where similar economic losses and maintenance problems are reported (Pascual 2012). Cuba’s fishing industry development occurred within a global context of environmental decline, the country being far from immune from those trends. There is ample documentation suggesting man-made causes contributed to the deterioration of the archipelago’s mangroves and coral reefs, although the extent of the damage is not definitely ascertained. Nor is there available a definite understanding of how Cuba’s experience compares to that of other countries. While Socialist Cuba’s development strategy negatively impacted the country’s marine environment (Díaz-Briquets and Pérez-López 2000), that same strategy inadvertently may have prevented even more worrisome consequences. Cuba’s decision not to develop tourism during many years proved to be a blessing in disguise. While it was closely aligned with the Soviet Union, Cuba pursued a capital- and input-intensive agricultural and industrial development model that, together with an aggressive expansion of the mining industry, damaged coastal habitats, and hence the health of platform fisheries. Among these were heavy discharges of contaminating chemicals along the shores, as chemical agricultural inputs (e.g., pesticides, fertilizers) were used in unprecedented quantities (for Cuba), rising fourfold between 1965 and 1985 (Díaz- Briquets and Pérez-López 2000:103–107). Coastal and estuarine habitats continued to be damaged by the untreated discharge of urban effluents into rivers or directly to the sea, and—in certain regions—by the release of industrial by-products and the debris of large-scale mining operations. The most significant releases were probably those associated with nickel and cobalt mining in Moa Bay; they are reputed to have had a “tremendous impact” on the mangroves of Holguín province (Cosano Alén 2003). The contamination of Havana Bay was extensive; a major effort has been underway since the 1990s to reduce the discharge of noxious contaminants. Some success is reported to have been achieved, with the bay’s level of contamination having declined by 55% by 2011 (Jiménez 2011). High concentrations of heavy metals have been reported in other coastal localities. In the Gulf of Guacanayabo, adjacent to Manzanillo, site of a rich fishery, industrial pollution, along with other hostile environmental changes (e.g., damming of the Cauto River, discharge of untreated sewage, mangrove damage), has been linked to the diminished capture of several commercial marine species. White shrimp and oysters—previously plentiful—are no longer abundant (Amat Infante and Casals Blet 2008). Disruptions of marine environments can also be traced to the mismanagement of coastal resources, some dating to before 1959 but aggravated since. There have been numerous reports of unsustainable exploitation of sand deposits along the breath of Cuban beaches, including in Baracoa (Cosano Alén 2007). The sustainability of coastal habitats was also compromised by overfishing and overexploitation of mangroves forests for wood and charcoal (Suman 2003:646). The emphasis on the development of the fishing industry and associated reliance on environmentally unsustainable harvesting practices led to the collapse of selected species, as evidenced by the decline in overall landings. Claro, Baisre et. al. (2001:194–219) review how overfishing (for shrimp, for example), together with habitat changes, has interfered with the capacity of some species to reproduce. Other contributors to catch declines have been widespread reliance on bottom trawlers and certain types of nets and traps. While efficient in initially increasing landings, these practices prove unsustainable over the long haul since they disrupt the ability of some species (e.g., lane snappers and mullets) to reproduce. Uncontrolled fishing for some species is also to blame. According to Wotzkow (2007), pressure to comply with Japanese contracts for shark fin led to the decline of several shark species, an outcome also suggested by Claro, Baisre et. al. (2001:215). Equally problematic were certain interventions that while presumably designed to mitigate natural constraints and environmental concerns in Cuba’s coastal regions, may have created others (Díaz-Briquets and Pérez-López 2000:129–30). One was the decision to build numerous water reservoirs by damming Cuban rivers. By minimizing runoff, recurrent fresh water shortages and the effects of droughts would be minimized. However, reduced rainwater flow resulted in creating seawater intrusions into coastal karst aquifers, also contributing to increased agricultural and industrial contamination (Molerio León and Parise 2007). In some areas, changes in the composition of coastal waters detrimentally impacted the reproductive potential of species spawning in mangrove habitats. Along the area’s coastline (between Surgidero de Batabanó and Playa Mayabeque), where the sea has encroached 140 meters inland, we saw evidence of fires, indiscriminate cutting of timber within the mangroves, as well as illegal removal of sand …despite the existence of numerous decrees, resolutions and legal documents in the country mandating the protection of mangroves … mangroves have been damaged by illicit cutting, as well as by disruption of the flow of water carrying needed nutrients, fires and dumping of trash. Similar concerns about the enforcement effectiveness of marine environmental regulations have been expressed by Symmes (2008). A naturalist and keen observer of Cuba’s marine environment for 15 years, he claims to have “listened skeptically to declarations about Cuba’s ecological achievements that seemed to defy the brown reality [he] saw on the ground.” Cubans, according to Symmes, blatantly ignore prohibitions against human consumption of green turtles, just as they violate international restrictions on the use of black coral for tourist trade ornaments. Driven by economic necessity, the detrimental impact of these violations is compounded, in Symmes’ view, by the inability of independent environmentalists to complain as they are ignored by the authorities. While the coastal environment was impacted by the issues alluded to above, Cuba avoided, as noted earlier, some of the worst environmental consequences of the explosive, poorly managed growth of the tourist industry. This was an unintended result of Cuba’s development approach during the 1960s-1980s, as it minimized the role of international tourism in the economy, currently the top priority. Insulated from broader global economic trends by Soviet subsidies, Cuba could afford to neglect tourism’s potential. With the Soviet bloc’s collapse, this strategy was no longer tenable, and Havana aggressively embraced in the 1990s a policy to develop the tourist sector as an economic survival lifeline. While in economic terms the policy has met with much success, it has been accompanied with appreciable environmental costs. What is not entirely clear yet is if the conservation regulations presumably adopted to contain further environmental damage are succeeding. Fortunately for the marine environment, the relative isolation of reefs located along Cuba’s outer shelf, in many cases separated from the main island by broad lagoons and offshore keys, afford a protective buffer. This isolation largely explains the acclaimed healthy status of the Jardines de la Reina reefs,5 south of the island of Cuba proper (Rader 2012). In fact, less than half the original coral cover remains in these reefs since many have been lost to bleaching and other natural causes, as in other Caribbean regions (Claro, Lindeman et al. 2001:19). The environmental damage to the Cayo Coco fishery came on the heels of earlier developments that over decades reduced the productivity of Cuba’s coastal marine fisheries. Confirmation of this assertion is provided by the 2012 Environmental Performance Index (EPI) report, an authoritative assessment of the global environmental situation and trends. Comprising comparative data for 132 countries across 22 performance indicators, the report assigns Cuba the 50th rank, placing the country amongst the group of “modest performers,” immediately following the United States (Emerson et. al. 2012). Cuba fared less well in terms of the Trend EPI, a pilot index whose rankings “measure performance changes from 2000 to 2010” (p. 26). With a Trend EPI rank of 101 (the United States ranked 77), Cuba places within the group of “declining performer” countries. Cuba’s EPI relatively positive placement is mostly explained by the combined weight of highly favorable health- and forestry-related indicators and less satisfactory “air quality,” “biome protection,” and “fish stocks overexploited” indicators. The latter, pertaining to fishing intensity within a country’s Exclusive Economic Zone, is indicative of the point at which “fishing intensifies past a sustainable level, and the harvest of a species has reduced that species’ capacity to replace its population through reproduction and growth” (Emerson et.al. 2012:51–52). Regarding “trawling intensity”—a fisheries indicator calculated by relating bottom trawling and dredging to the size of catches caught with these methods—the ranking was much better, a likely reflection of prohibitions regarding the use of these previously widespread destructive fishing practices in Cuban waters. From 1970 to 1975, increased fishing effectiveness (e.g., use of trawls, seines, and set nets) resulted in overfishing of several important species (lane snapper, mullet, Nassau grouper, stone crab, and shrimp in some regions). Overfishing also resulted from the use of unselective fishing gear, the indiscriminate use of set nets during spawning migrations, and limited enforcement of some fishery regulations (e.g., minimum legal size, closures during spawning periods). As a result of intense development of the fisheries industries since the 1970s, the Cuban shelf is close to maximum exploitation. The deterioration of coastal habitats has also contributed to the reduction of some resources (shrimp, mullet). Decreased yields of some resources (lobster, sharks, batoids) and the replacement of species of high quality and size by others of lower value have occurred. In spite of its discouraging tone, the Claro assessment ended with a relatively upbeat note as it concluded that there was still room to more fully exploit some marine resources. To do so, it would be necessary to utilize more efficient fishing techniques, improve the capacity to detect ciguatera poisoning, conduct comprehensive fisheries research, and enforce effective regulations to protect marine life and their environments. The Claro, Baisre et. al. 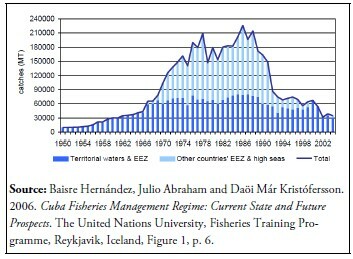 (2001) and Baisre, Abraham and Kristófersson (2006) fisheries sustainability assessments broadly validate the findings reported in the 2012 EPI report, confirming that the fishing approach Cuba pursued between the 1960s and 1980s was unsustainable for environmental as well as financially reasons. Environmentally, it did not make sense due to its high ecological costs, and neither did it make sense financially as it proved feasible only when subsidized by the Soviet Union. Rising fuel costs further compromised the financial viability of the Cuban international waters fishing fleet. Such considerations and Cuba’s 1990s belated decision to embrace a “Green Agenda” have allegedly resulted in a major rethinking of the country’s fishing industry approach. The emphasis of the 1996 Decree-Law 164 (Fisheries Regulations) appropriately shifts the focus away from quantity of fish landings towards sustainability of fisheries and catch profitability. The enactment of regulations to protect Cuba’s environment, and in particular some of its fisheries, dates back to the late 1970s and early 1980s. Concern about the long-term sustainability of Cuban fisheries at the time led to modest conservation measures, mostly to protect lobster and shrimp fisheries (Claro, Baisre et. al., 2001:196). More recently several Decree- Laws, including 201 (Protected Areas) and 212 (Coastal Zone Management) are products of a changed scenario as they reflect—and are part and parcel—of mounting concern and increased awareness about environmental issues in Cuba since the early 1990s (Suman 2003). This has resulted in the enactment of a comprehensive modern environmental regulatory framework (Whittle and Rey Santos 2011; Environmental Law 2003; Díaz-Briquets and Pérez-López 2000:46–78) that has garnered considerable international attention and support. A reflection is increased collaboration between U.S. and Cuban scientists, and the provision to Cuba of financial and technical support by U.S. and international NGOs, non-U.S. bilateral assistance, and assistance from specialized United Nations agencies. How effectively these environmental regulations are being implemented, however, is uncertain and possibly uneven. On the positive side, Cuba has adopted far more environmentally- friendly fisheries management practices, including gear restrictions, minimum legal size limits, season and area closures to protect reproduction of particular species, set catch quotas, fishing licensing regulations, temporary fishing moratoriums to allow threatened species to recover, and protection of selected marine environments (Baisre Hernández, Abraham and Kristófersson 2006; see also Oficina Nacional de Estadísticas 2008:127). In August, 12, 2001, the Convention on Wetlands of International Importance, the Ramsar Convention, came into force in Cuba. First adopted in 1971 at that Iranian city—and in force since 1975—the convention’s mission is “the conservation and wise use of all wetlands through local and national actions and international cooperation, as a contribution towards achieving sustainable development throughout the world.” As a result, five new protected wetlands—aside from the previously protected Ciénaga de Zapata—covering 1,210 square miles were added in 2003. They are the Buenavista Bay, Lanier Marsh, and the wetlands (humedales) of Norte de Ciego de Avila, Cauto River, and Río Máximo- Camagüey (“Cuba saves” 2003; Oficina Nacional de Estadísticas 2012:28). In addition, with UN support, Cuba is moving ahead with a national mangrove protection program (Peláez 2011a; Peláez 2011b; Peláez 2011c). Other marine protection measures include permanently prohibiting (veda) the capture of marine turtles (“Declaran la veda” 2008) and the removal of houses built by government-owned enterprises in tourist resorts located in the environmentally fragile sand dunes of Holguín province (“Autoridades” 2012). Conservation measures extend to encouraging the population to fish and eat lionfish (“Cuba busca” 2011). Throughout the Caribbean, this destructive invasive species represents a major threat to corals and many native fish species (World Resources Institute 2011). Human consumption of lionfish—a measure first advocated in Florida as a control measure—may be far more difficult in Cuba than elsewhere as independent fishing is discouraged and fishing gear is scarce (Gladnick 2011). Although fishing is largely prohibited in marine reserves and fishing restrictions are presumably monitored, “enforcement efficiency [of regulations] is reported to be inconsistent” (Claro et. al. 2001:218). Observers with first-hand experience with the application of environmental norms note that regulations are often only enforced on a pro-forma basis (e.g., checking the boxes in bureaucratic checklists) or are ineffectively applied due to conflictive roles between (and within) environmental and economic development government agencies (personal communication). The Cuban Coast Guard (Vázquez García 2012), together with the country’s environmental agencies, tasked with enforcing fisheries regulations, for example, face other responsibilities while suffering from the same financial constraints affecting every other government dependency. While it is still too early to conclude how effective the fisheries conservation initiatives will prove to be the over the long-term, findings from the Baisre and Kristófersson (2006:20–28) study regarding the prospects for Cuba’s four main fisheries species are instructive. To evaluate these prospects, the authors relied on a standard statistical tool (the Schaefer model) used to assess the maximum ecologically sustainable yield to be expected based on secular catch and level of fishing effort data. The model’s results suggest current catch levels for three of the fisheries (lobster, shrimp and several fin fish species) appear to be sustainable. Current levels however are considerably lower than average landings during the 1980s, as shown in Table 1. The study further concluded that the fisheries’ sustainability had been enhanced by the conservation regulations in effect since the mid- 1990s. Nevertheless the possibility was not discounted that the apparent fisheries recovery may have been induced, at least partially, by “other factors such as generally difficult economic conditions” that may have reduced catch size (Baisre Hernández, Abraham and Kristófersson 2006:21). Another factor that might be involved—but not noted by the study’s authors—is the revival of fishing cooperatives, as their members are invested in the preservation of coastal ecosystems. The situation regarding the tuna fishery was found to be different. In this fishery, catch levels fluctuate from year to year, with the fleet failing consistently to reach maximum sustainable potential. One factor clouding this fishery’s analysis is that tuna is a migratory species that moves in and out of Cuba’s Exclusive Economic Zone. Among other factors contributing to uneven performance are reliance on rudimentary fishing techniques and problems handling live bait. Beginning in the early 1990s, the Cuban fishing industry experienced a monumental collapse. For all intents and purposes, the presence of the national fishing fleet in international waters is a thing of the past, with many of the larger and long-range fishing vessels taken out of service or converted to freighters (personal communication from a former fisheries official). The severing of close economic ties with the former Soviet Union and its former Eastern Europe allies was the death knell for the Cuban international waters fishing fleet. The performance of the platform fisheries, while not as dire, has not been particularly strong either. The decline in the catch for mollusks and crustaceans has been very significant, and even more so for several fish species. The end of foreign subsidies for the acquisition and maintenance of boats, fishing gear, fuel, and processing facilities, together with overambitious fishing targets devoid of environmental considerations, were instrumental in the productivity decline of fisheries. With revolutionary Cuba belatedly discovering “environmental religion,” a long overdue and comprehensive conservation framework has been articulated and presumably is being implemented. How effectively the implementation is open to question given Cuba’s current economic crisis, crash development of the “sand and sea” tourist industry, pervasive poverty, and the bureaucratic nature of the Cuban state. The conservation bureaucracy is complex, that alone giving rise to skepticism among those familiar with the rigidity of the socialist Cuban state. Crash exploitation of natural resources, furthermore, is an inevitable sequel—in Cuba and elsewhere—of poverty, food scarcity, and inadequate diets, as is the pervasiveness of corruption and the black market in the country. Just as uncertain is the reversibility of the environmental damage suffered by Cuba’s coastal environment and how effective conservation and recovery efforts will in fact prove to be. On the positive side, Cuba’s marine environment, albeit damaged, is reputed to be in better shape than in other Caribbean countries because of these countries’ earlier embrace of ecologically unfriendly development of the tourist industry. In addition, Cuba has a well-trained cadre of fishing experts, marine scientists, and environmentalists—although much diminished by emigration in recent years—said to be committed to the preservation of the country’s natural resource endowment. Also in Cuba’s favor is the growing presence in the country of an international community of experts and institutions concerned with the preservation of our shared natural environment. It is far from certain, however, whether the government has the political will to enforce environmental regulations and override pressing short-term economic considerations. Ironically, in the immediate future, the state of the economy will likely help preserve Cuba’s fisheries since financial resources are lacking to operate the fishing fleet at maximum capacity. Hopefully a sustainable recovery, albeit at a lower catch level, will someday follow the drastic collapse of platform fisheries. 1. My thanks to Jorge Pérez-López for his support in locating data sources and to René Costales, Yociel Marrero and ASCE conference participants for their comments on an earlier version of the paper. 2. 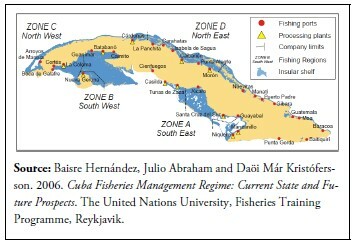 While the paper focuses mostly on platform fisheries, when relevant the discussion also refers to open ocean fisheries within Cuba’s Exclusive Economic Zone (the 200 nautical miles from shore claimed by countries for fishing and other economic purposes) and, for some periods, fisheries located in international waters. 3. Cuban fishing statistics aggregate some sixty species under this category, many fished in limited quantities, even though some, such as stingrays, are captured in significant numbers (Claro, Baisre et.al. 2001:215). 4. As was the case with the Soviet international waters fishing fleet, Cuban trawlers were on occasion deployed as poorly disguised intelligence collection vessels, trailing U.S. Navy ships and monitoring space launches off Florida’s Cape Kennedy. Cuban “fishing fleet” vessels are also known to have been used in support of Cuban internationalist missions, clandestine and otherwise, in Latin America and Africa. 5. Multiple sources have claimed that another reason the Jardines de la Reina were little disturbed and have remained so well preserved is that Fidel Castro, an avid underwater fisherman when he was healthy, regarded them as his private marine sanctuary.